Palm Springs is a place of escape. 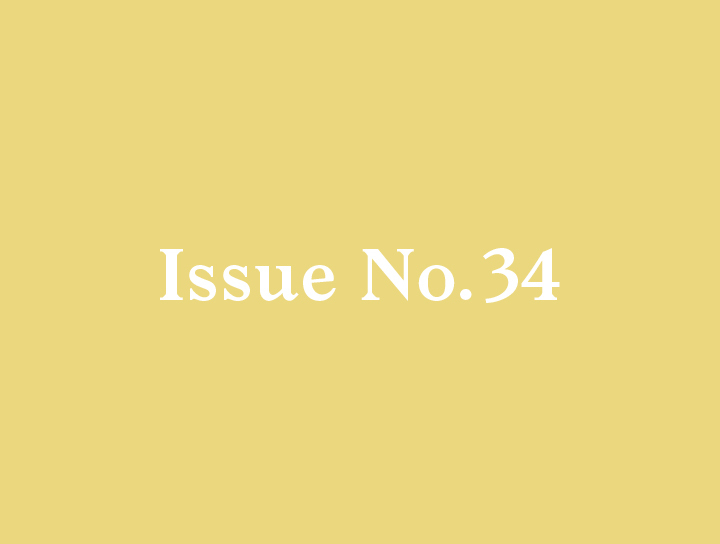 The sleepy town in the desert emerged in the period we now call “mid-century” as a result of an obscure clause in the contracts of movie stars. It required that, while under contract, actors must show up for work on demand with just two hours notice. Take a quick look at Google maps and check the directions from Hollywood to Palm Springs, and the reason the town became attractive to the mid-20th-century movie star crowd is revealed: It’s 112 miles from Hollywood. For movie stars of the day seeking an obscure place to get away, you couldn’t go any farther and still meet your contract requirements. 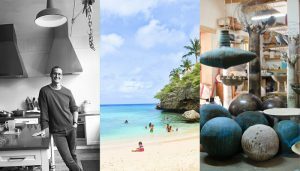 Now that the city has grown from just a few shops servicing the smattering of movie star homes hidden away in the surrounding hills, to a massive artificial oasis, it has become an escape of another kind. 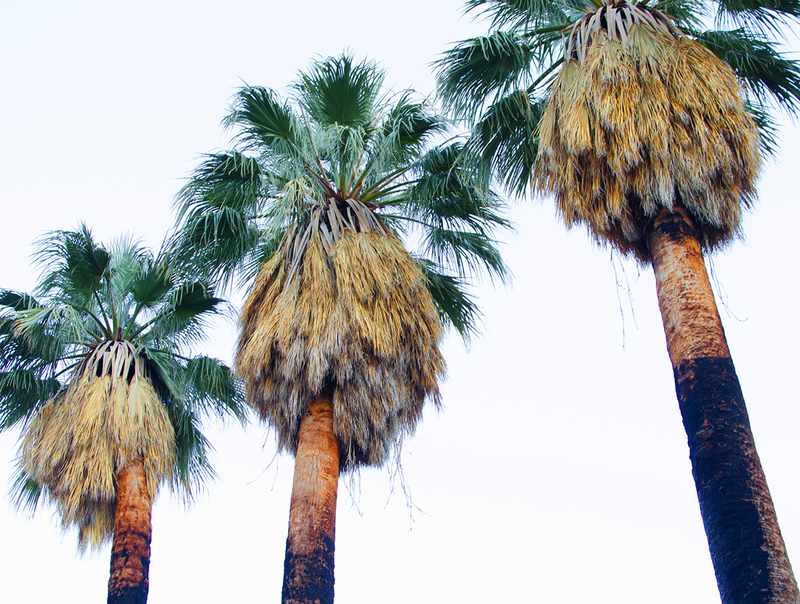 Winter in Palm Springs is like spring most anywhere else, so it is a major draw as an escape from the cold. But that’s only for a few busy weeks each year. The rest of the time Palm Springs is HOT! If you have ever been there in the summer you are familiar with the necessary dash from one air-conditioned place to another to keep from wilting under the sun’s relentless heat. It’s easy to assume that without modern technology it would be uninhabitable here except for a few weeks in winter. All the more curious then to discover that long before there was a Palm Springs, this patch of desert was the thriving center of an indigenous culture which easily dealt with the heat and mastered the landscape, prospering for 2,000 years. 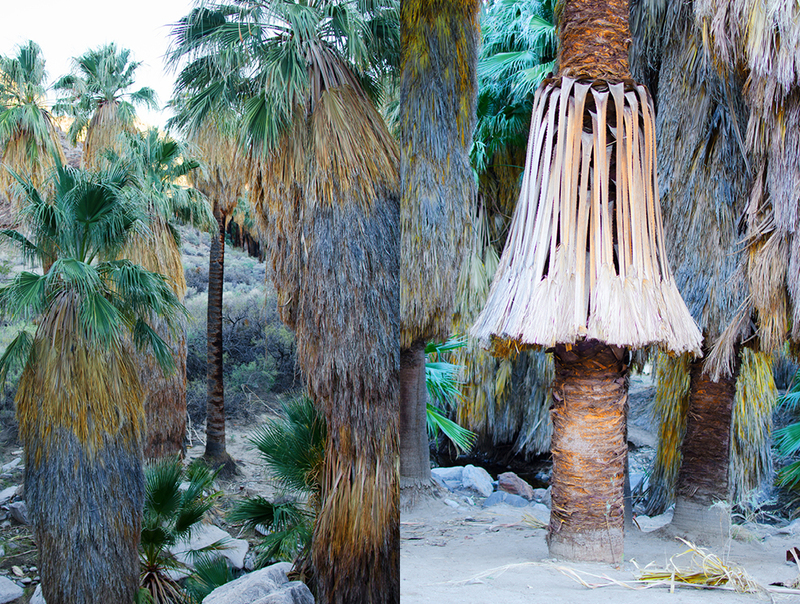 The main reason for their success lies just six miles from modern downtown Palm Springs in a place called Palm Canyon. The short trip will take you all the way from dry, oppressive desert heat, to cool breezes, palm trees, and trickling streams. 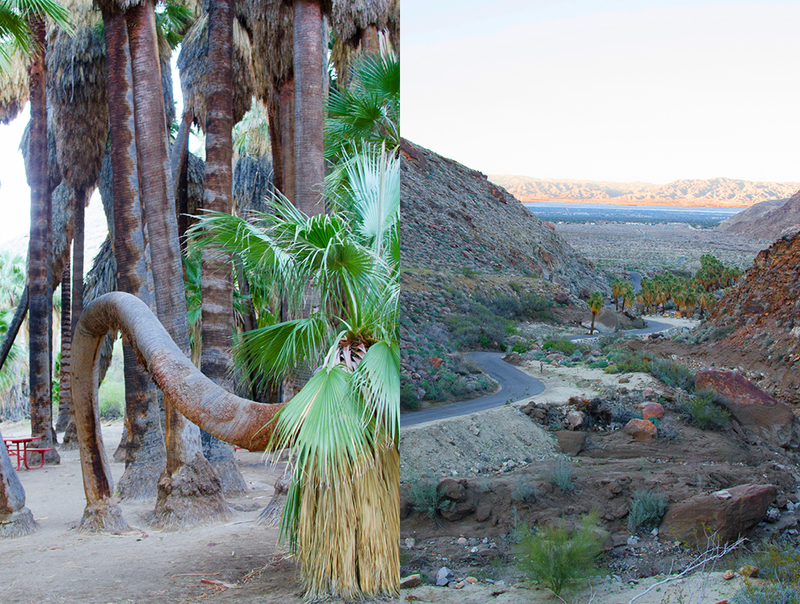 Walking the 15 mile Palm Canyon Hike is a delightful respite from the heat and hype of the city. 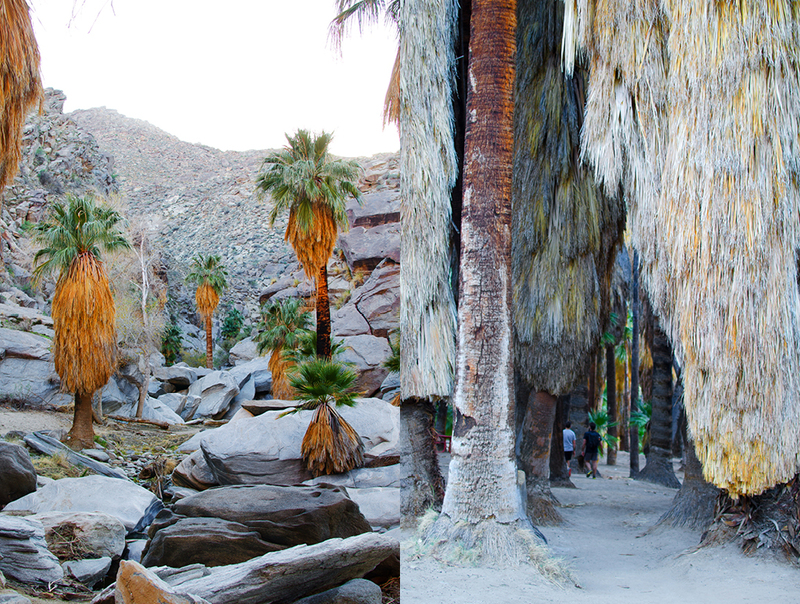 The Palm Canyon Hike is one of the most beautiful hikes in western North America. 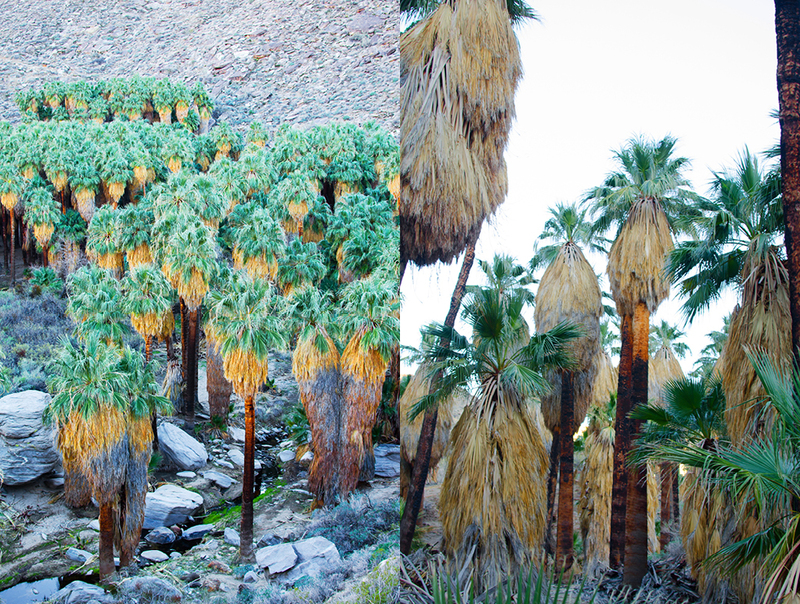 Palm Canyon’s indigenous flora and fauna, which the Cahuilla people so expertly used, and its abundant Washingtonia filifera (California Fan Palm), are breathtaking contrasts to the stark rocky gorges and barren desert lands beyond. A moderately graded footpath winds down into the canyon for picnicking near the stream, meditating, exploring, hiking, or horseback riding. 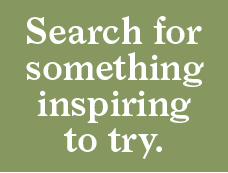 While in Palm Canyon visit the Trading Post for hiking maps, refreshments, Indian art and artifacts, books, jewelry, pottery, baskets, weavings, and conversational cultural lore. 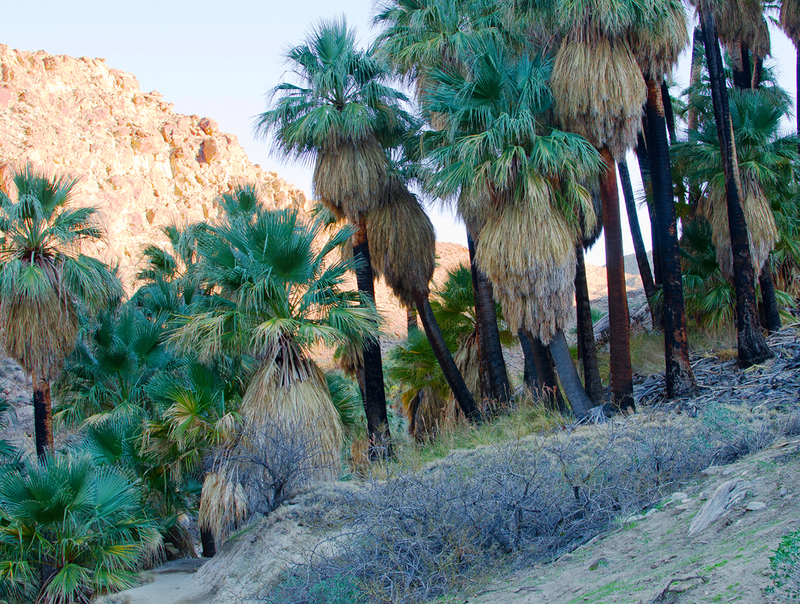 Centuries ago, ancestors of the Agua Caliente Cahuilla (pronounced Kaw-we-ah) Indians settled in the Palm Springs area. 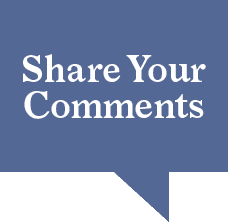 They developed complex communities in the Palm, Murray, Andreas, Tahquitz, and Chino canyons. 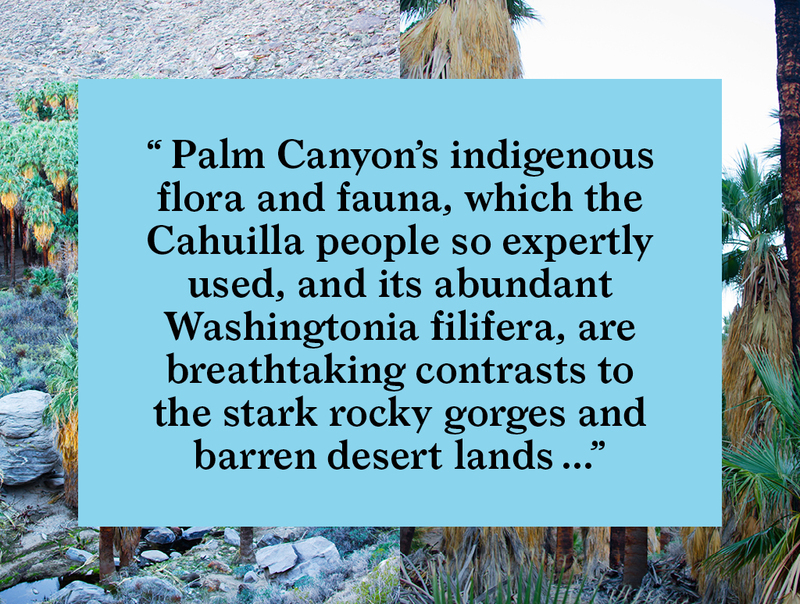 With an abundant water supply, the plants, animals, and Cahuilla Indians thrived. The Cahuilla grew crops of melons, squash, beans, and corn. They gathered plants and seeds for food, medicine, and basketweaving. 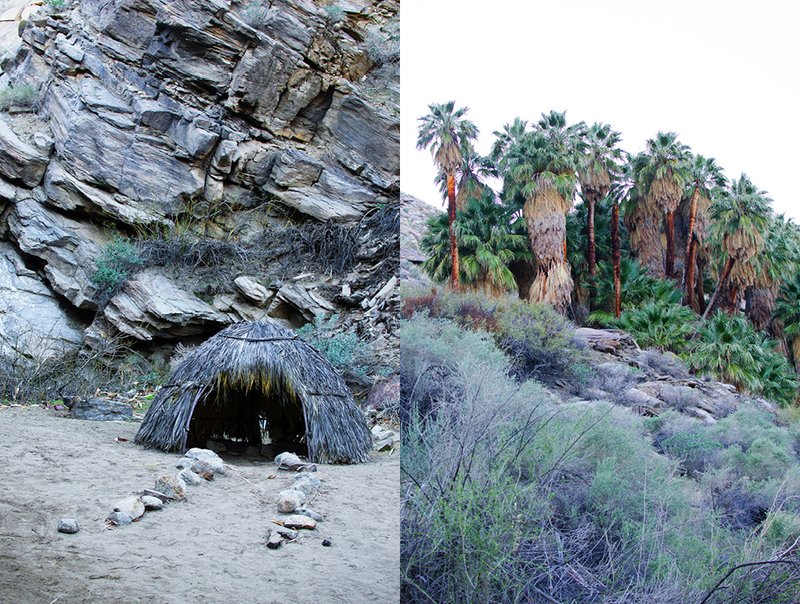 Today, remains of Cahuilla society, like rock art, house pits, foundations, irrigation ditches, dams, reservoirs, trails, and food preparation areas, still exist in the canyons. The Agua Caliente Indians were industrious and creative with a reputation for independence, integrity, and peace. They believed this productive land of their ancestors would always be theirs. However, in 1876, the U.S. Federal Government deeded in trust to the Agua Caliente people, 32,000 acres for their homeland, but at the same time gave the Southern California Railroad ten miles of odd sections of land to induce them to build the railroad. Of the reservation’s 32,000 acres, some 6,700 lie within the Palm Springs city limits. The remaining sections fan out across the desert and mountains in a checkerboard pattern. 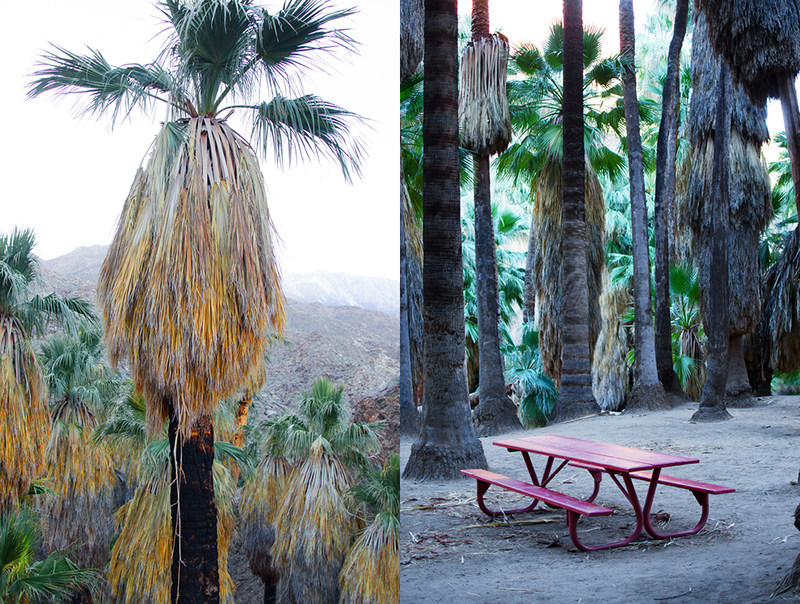 Since the 1890s, Palm Springs and the surrounding area have been considered a recreation oasis. Tahquitz Canyon and three southern canyons are listed in the National Register of Historic Places. 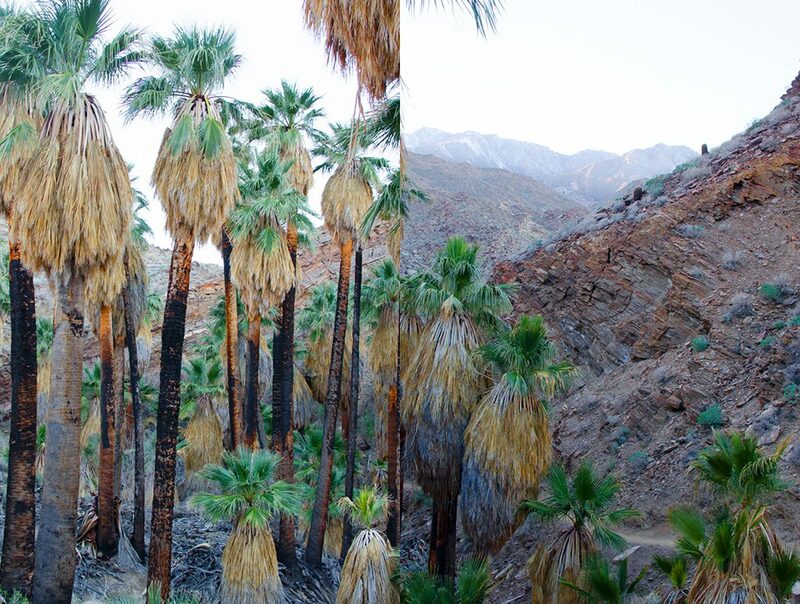 Palm Canyon is considered the world’s largest California Fan Palm oasis. A small footpath leads from the parking lot and visitors center right into the canyon. There are several trails to choose from, leading along little creeks and the majestic palm trees. The paths are easy, with no need for heavy hiking gear. We decided to venture out at the end of the day, when the canyon is in the shade. When we arrived, most visitors were leaving the parking lot, so we had the trails mostly to ourselves. It was beautifully quiet, with just a little crackling of the creeks. Birds followed us along our walk while the sun slowly set behind the mountains. 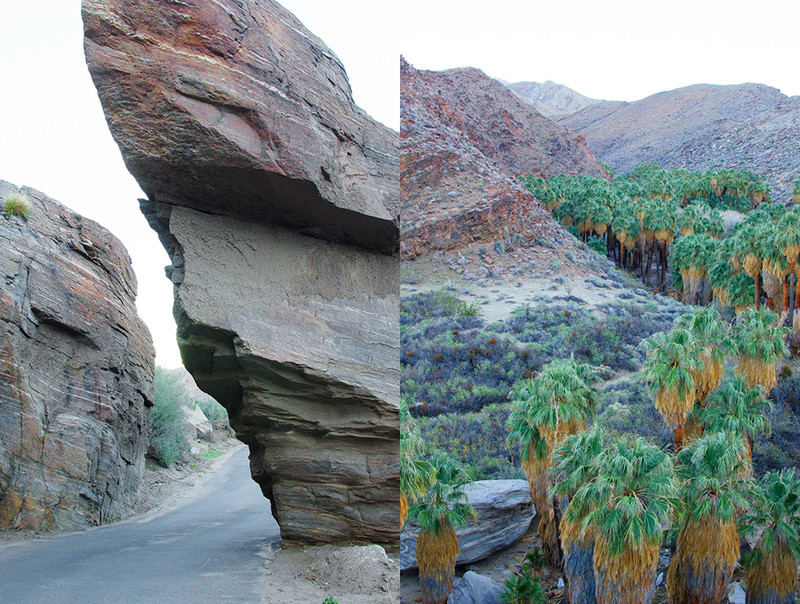 This little canyon is definitely worth the trip to Palm Springs. Make sure you add it to your list when you’re in the area. 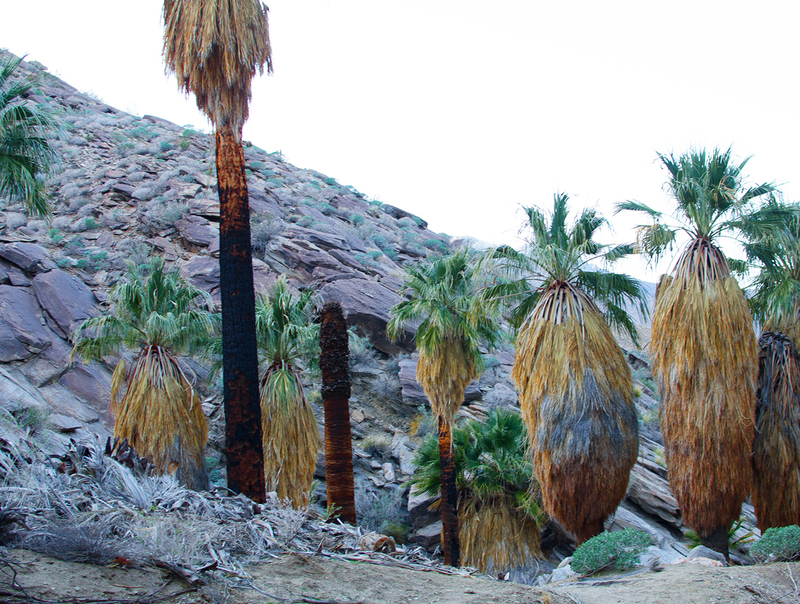 Planning to do the Palm Canyon Hike? Here is the current weather and what to expect for the next few days.